We need examples and experiences in sustainable home renovation for making the transition from gas to heat more common. Part of City-zen is the renovation subsidies for homeowners. Homeowners (private individuals, owners associations, housing corporations and investors) in Amsterdam made use of the European City-zen subsidy to make their homes very energy-efficient. The most important criterion included a considerable improvement in the energy performance of the home. Thus far the story of someone who, just because of his enthusiasm, is able to convince his surroundings to make the same sustainable step. That comes in handy during the start of renovation and remodelling trajectories, but afterwards – when it’s down to the execution – it’s basically imperative. In Bert’s case this didn’t came off easy. But, all’s well that ends well. The house is almost entirely self-supportive, is certified with energy label A, is newly appraised and has increased in value. But that didn’t come without some struggles. And that’s something that is worth to share too. “I opted for a total package. Convenient, because with the entire renovation being done by one construction company the quotation includes everything. Once we were in the process, I found out that the energy consultant didn’t have as much experience as I previously thought and many things were new. I couldn’t rely on a good coordination and planning. This caused many frustrations and delays in the project. We’d agreed on a fixed price, so the setbacks and additional costs were for the energy consultant. Except for a bit more energy the project fortunately didn’t cost more. Giving feedback to the consultant didn’t make much sense, since this was evaded or unanswered. 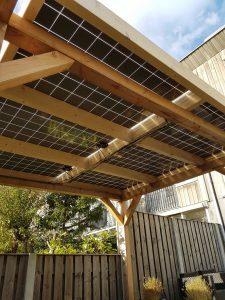 “I now like to share the experiences that I have gained with others who are interested in sustainable renovating their dwelling. At the time I also looked for people in my personal environment and professionals to assess my experiences. All insights help and it’s also a good thing that I wasn’t aware of all the risks in advance. Now the renovation, after an initial delay, is completed successfully, Bert also takes part in a pilot project. The City-zen Virtual-Power-Plant pilot is a battery that stores the sustainable generated energy. This gives Bert the chance to relax. Do a background check of the energy consultant’s company: continuity, delivery time, and experiences in sustainable home renovation.